Journey of a Tibetan: Interesting Tale of Two RTYC NYNJ? Interesting Tale of Two RTYC NYNJ? Recently, it's not uncommon to hear on the streets of New York on the existence of two inevitable groups of Tibetan immigrants: one group supporting the Rangzen (independence) and another supporting Central Tibetan Administration's official stand of Middle Way Approach. However, unlike other Tibetan immigrant communities, New York and New Jersey carries an important weight when it comes to the Tibetan politics in exile. New York is not only the city with the largest group of Tibetan immigrants outside India but also share an important geopolitical space with United Nations Headquarter to help work for the betterment of Tibetans living in Tibet. As such, any organizations or activities in New York has a potential to generate domino effect in other parts of the world. One such big organization is Regional Tibetan Youth Congress of New York and New Jersey (RTYC NYNJ hereafter). Irrespective of what happened with RTYC NYNJ in the past couple of years, everyone agrees with the importance of its existence. But the question I am raising here is on its existence. RTYC NYNJ conducts all its activities including facebook page in the name of Regional Tibetan Youth Congress of New York and New Jersey or RTYC NYNJ. However, its legally incorporated name in the state of New York is TIBETAN YOUTH ASSOCIATION INC, registered on March 17, 2005. 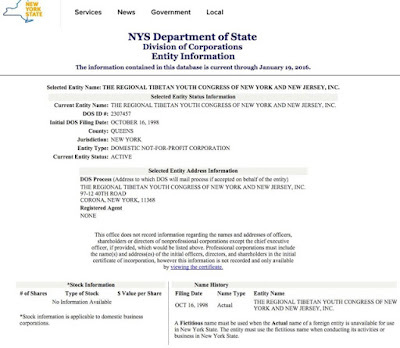 A snapshot of its entity information at NYS Department of State's Division of Corporations is attached below. If you have a problem viewing the snapshot, click here. To use DBA (Doing Business As) or Assumed Name such as RTYC NYNJ, it has to be approved by NYS Department of State. However, the problem with DBA or Assumed Name is that you are not allowed to use existing corporation's name. 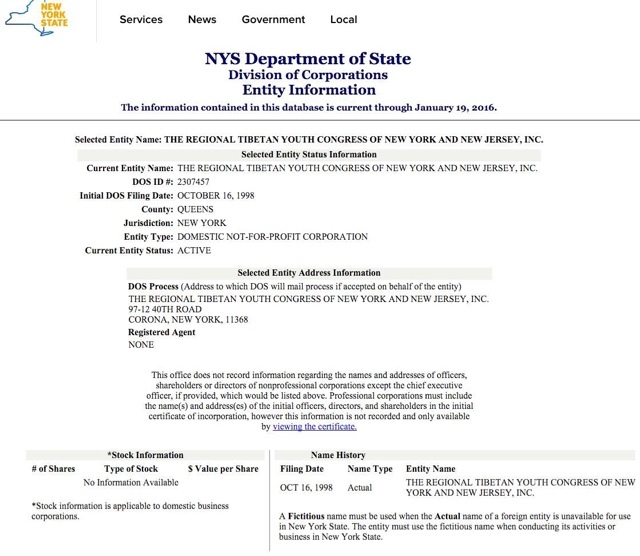 RTYC NYNJ is exactly using an existing corporation's name. 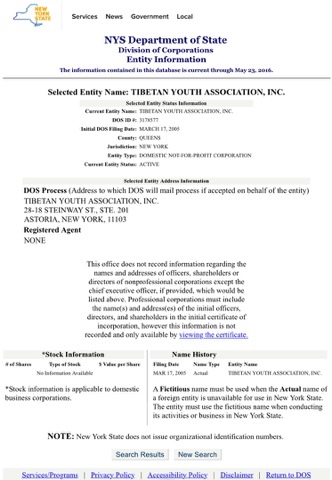 If you see the next snapshot, you will find that The Regional Tibetan Youth Congress of New York and New Jersey Inc was already a registered organization in the state of New York. It was first registered on October 16, 1998 and the current entity status is ACTIVE. The organization address with NYS Department of State is 97-12 40th Road, Corona, New York 11368. If you have a problem viewing the snapshot, click here. According to New York Not-For-Profit Corporation Law Section 202(f), "No corporation shall conduct activities in New York state under any name, other than that appearing in its certificate of incorporation, without compliance with the filing provisions of section one hundred thirty of the general business law governing the conduct of business under an assumed name." Please note that corporation here also implies to non-profit organization. What does this mean to RTYC NYNJ aka Tibetan Youth Association Inc? First, they may be conducting its activities and programs against New York Not-For-Profit Corporation Law by using other entity name as DBA or Assumed Name. Second, RTYC NYNJ may need to figure out who were the three founding members at the time of the incorporation of The Regional Tibetan Youth Congress of New York and New Jersey. This information could be helpful for several reasons for which I will not speculate here. Third, RTYC NYNJ should immediately stop conducting its activities or programs in the name of Regional Tibetan Youth Congress of New York and New Jersey or RTYC NYNJ until this issue is resolved.